One of the most striking things I noticed when I set out on my first day in Yangon for a stroll through the city was the women. Burmese women are beautiful, innocent and quite elegant. Their pressed blouses and the cut of their long skirts, hugging their hips tightly, exude a graceful sensuality that is lost among the low-cut tank tops and miniskirts of Western pop culture. Like people in most of the developing world, they don't leave the house unless they are well-dressed - according to conservative conventions - and wearing makeup. Burmese makeup is unlike any I've ever seen. 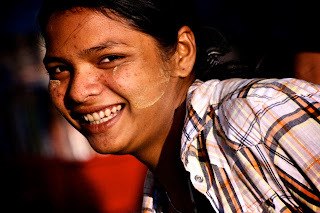 Many of the women - and small children, as well - paint a thick stripe of gold-colored paste in a wide stripe across their cheeks and sometimes their forehead. Thanaka - made from grinding the bark of the Thanaka tree into a powder - is actually very beautiful if applied well, with a bright gold streak running down the cheek under the eye, fading as it reaches the ear. I found my glance lingering on the face of many a young woman as I passed, and my heart warmed when their bashful eyes met mine and they broke into a wide, inviting smile. But thanaka is not merely makeup - it has a myriad of uses. It's also good for the skin, protects against sunburn, and its scent is intoxicating. Well please tell me you got your hands on some! I'd like to give this Thanaka a try! Oh yeah! brought back some of the bark AND the powder. I love it.